A study of schools in South Korea has found that seventh-grade girls who are assigned to female teachers perform better on standardized tests, enroll in more advanced classes, and are more likely to make plans to attend college. The effects were observed from middle school into high school and are particularly pronounced in STEM disciplines like math and science. The new study comes as the relative absence of black and Hispanic teachers has become a topic of interest in education research, with multiple reports indicating that exposure to same-race teachers could hold powerful advantages for minority students. Some have speculated that girls, who indicate in wide-reaching opinion surveys that they enjoy school less and feel increasingly unconfident in their abilities as they grow older, could see similar gains from being taught by female instructors. The study, released by the National Bureau of Economic Research, was conducted by Texas A&M associate professor Jonathan Meer and graduate student Jaegeum Lim. The authors followed over 4,000 students dispersed across a sample of 74 middle schools in Seoul, the nation’s capital. In the Korean education system, high school students choose among academic specializations, with most schools offering both math/sciences and humanities/social sciences tracks. The nation provides a particularly promising ground for research because both students and teachers are assigned randomly to classrooms. Test scores provide the clearest evidence for the benefits of student-teacher gender matching. An existing female-male gender gap in standardized test scores was noticeably widened by the presence of a female teacher. Roughly half of that effect is due to improved performance from girls, coupled with an adverse impact on boys’ scores. What’s more, the effects are shown to carry over into high school. “Somewhat surprisingly, we find that the gender gap effects persist even five years after the initial teacher-student gender match,” the authors write, noting that the impact of being assigned a female teacher did not vary significantly after the students matriculated from middle school into high school. 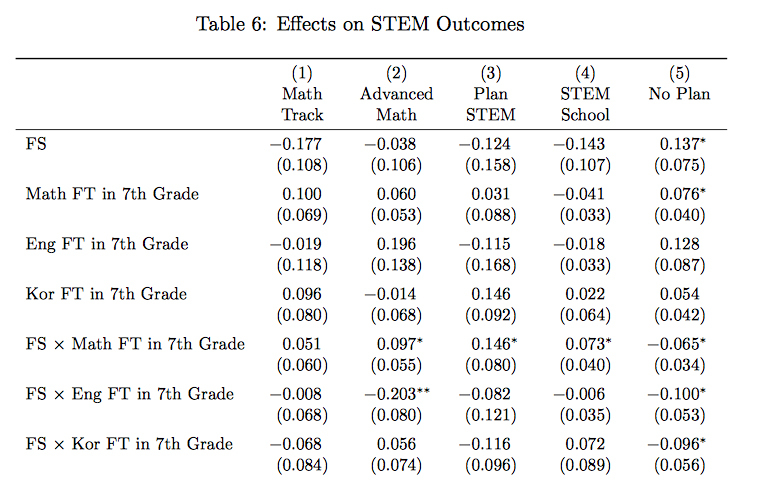 Though academic performance for girls is improved across the board when they are assigned a female teacher in the seventh grade, the effects are particularly noteworthy in the context of STEM disciplines. In South Korea, as in many other developed nations, women are significantly underrepresented both in higher-level science and mathematics classes and in the engineering and computer science workforce. Indeed, national cultural norms in Korea have only recently begun to shift from a widespread and openly expressed preference for male children. The authors find that exposure to a female teacher in the formative adolescent years could be a critical step to reversing those disparities. 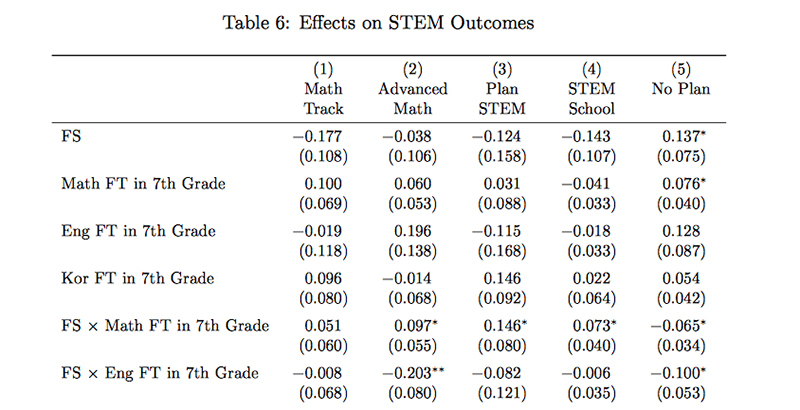 Girls who were assigned female instructors in seventh grade were 15.1 percentage points more likely to choose a specialized math track in high school, and 15.7 percentage points more likely to take advanced math classes in 11th grade. They were also more likely to enroll in a STEM-focused high school and report interest in majoring in math or science in college. Other studies have shown that the positive impact of gender matching could begin long before middle school. In a 2013 study, researchers from Claremont McKenna College found that girls in elementary school performed better on standardized math exams if they studied under a female teacher with more than six years’ experience teaching the subject.